Defining features for this beautiful waxy cap include its not-quite-conic, not-quite-convex, sticky, orange cap; its stem, which becomes fibrillose as it ages; and its frequently constricted spores, which do not usually exceed 10 µ in length. 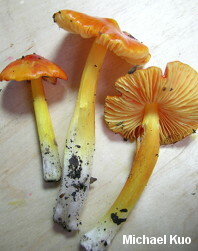 Similar species include Hygrocybe acutoconica, which has a decidedly conic and much drier cap, along with spores that usually exceed 10 µ; and Hygrocybe marginata, which has a dry cap, a smooth stem, and bright orange gills that contrast with the paler cap and stem as the mushrooms mature. 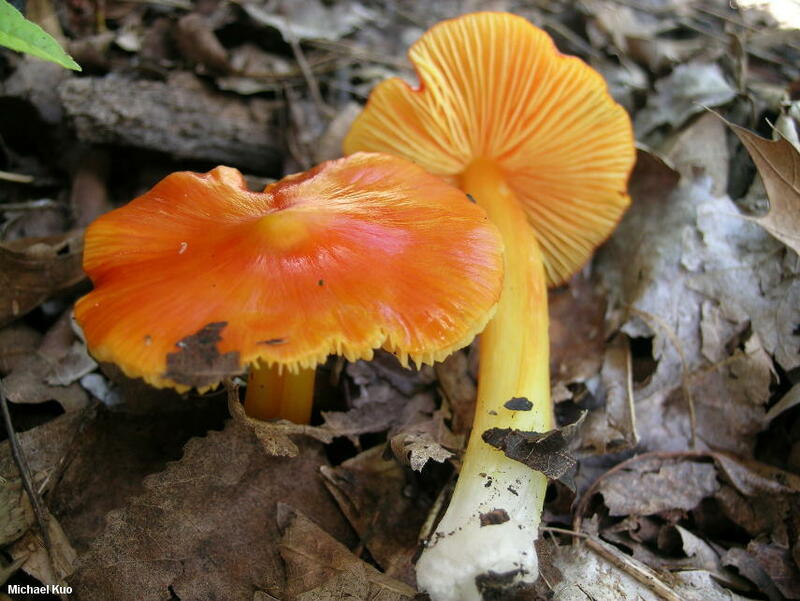 Hygrocybe aurantiosplendens was originally described from Switzerland, and our North American versions may be distinct. Following Largent (1985), the name is often used for material on the West Coast that does not appear to me to match the original concept very well (it is too red, too convex, too smooth-stemmed, and has non-constricted spores), and does not correspond well to the eastern North American version. The eastern North American version appears to match the European concept more closely, but a thorough, contemporary study of the species group is needed. Ecology: Precise ecological role uncertain (see Lodge and collaborators, 2013); growing scattered or gregariously under hardwoods; summer; North American distribution uncertain (see comments above). The illustrated and described collection is from Illinois. 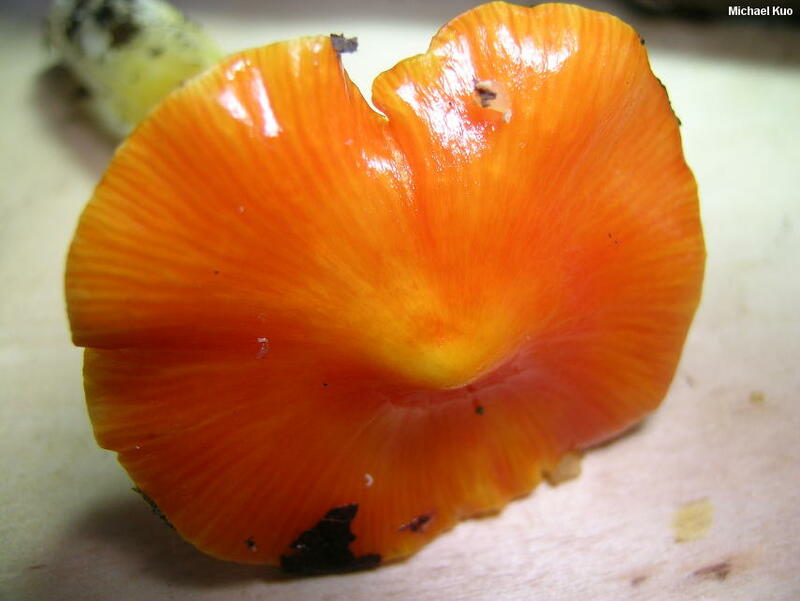 Cap: 3.5-5 cm; broadly conical at first, expanding to plano-umbonate; slimy to sticky; bald; dark bright orange; the margin translucently lined. Gills: Narrowly attached to the stem; close or nearly distant; yellow. Stem: 6-9 cm long; 0.5-1 cm thick; more or less equal, or slightly tapering to apex; a little tacky when handled; bald at first, becoming fibrillose with age; yellowish orange; white at the base. Flesh: Yellowish or orangish; thin; not blackening. 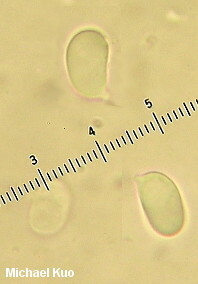 Microscopic Features: Spores 8-10 x 6-7 µ; smooth; ellipsoid, but frequently constricted; smooth; hyaline in KOH; inamyloid. Basidia 4-spored; to about 60 µ long. Hymenial cystidia absent. Lamellar trama parallel or nearly so. Pileipellis an ixocutis. REFERENCES: R. Haller of Aarau, 1954. (Moser, 1983; Largent, 1985; Arnolds, 1990; Boertmann, 2000; Bessette et al., 2012; Lodge et al., 2013.) Herb. Kuo 06161002.